This lithograph is taken from plate 11 of 'Views in the Himalayas' by Mrs WLL Scott. 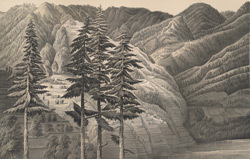 According to Scott, the 10-kilometre tall mountain of Hattu, seen here from the road to Narkanda, was covered in dark forests thickly inhabited by bears and "hyenas". It was not to be "explored by night". Of the objectives behind her doughty travels, she wrote: "the possibility of employing my time profitably and satisfactorily in the service of my poorer brethren had often occurred to me, and having been informed that the Governor-General, and some other parties, had expressed a wish for some correct views of scenes in the Himalayas familiar to the everyday traveller, I resolved to try to satisfy the demand, in aid of the Lawrence Asylum." The asylum relied on voluntary contributions for most of its funds. Maharaja Gulab Singh of Kashmir had given £10,000, a huge sum in those days.